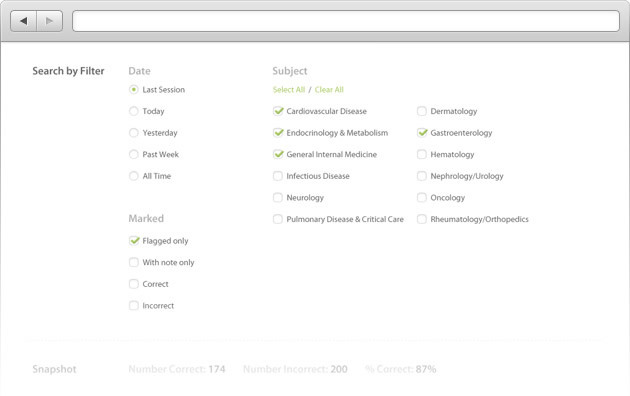 Filter the internal medicine questions to focus on a specific medical category or select them all. 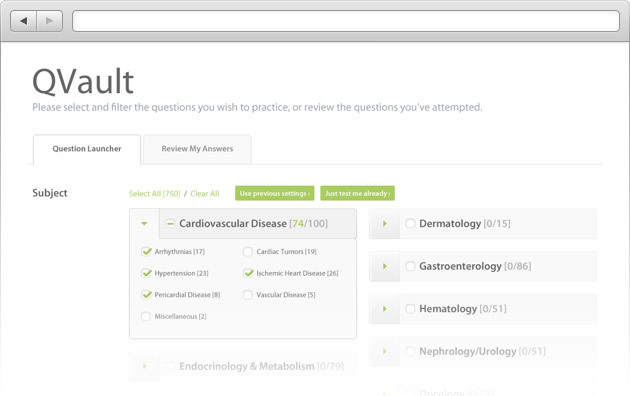 There are over 900 questions developed using the ABIM Internal Medicine Board Exam Blueprint . Read the question and select one of the answer choices. Watch our concise explanations with animations to drive home the key concepts, or read the text version of the explanation. 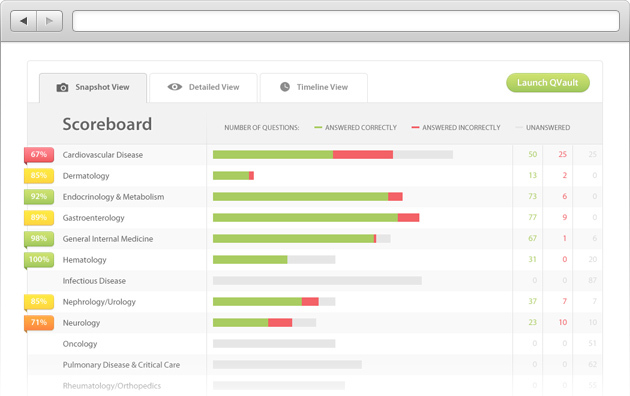 Track your performance across medical and diagnostic categories in Snapshot and Detailed views. The Timeline view features a summary of your performance by day, week, or month. 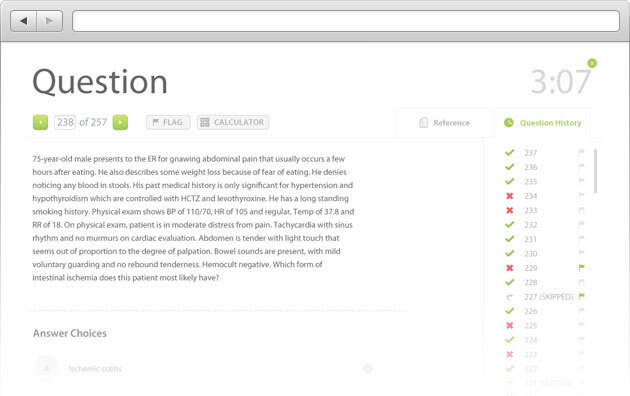 Easily find questions you've answered through filtered search or by keyword. 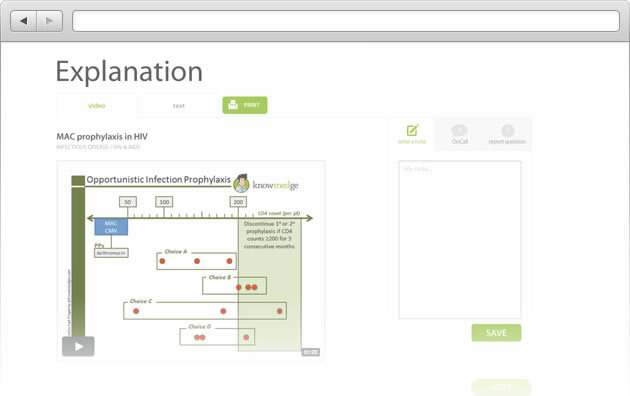 Check out a few of our video and text explanations. This is just one of our features. See them all. 35-year-old female presents to the hospital with mid-epigastric tenderness that radiates to her back. She has been experiencing this for the past three days. She says the pain is constant and made worse with eating. She also complains of some nausea and vomiting and low grade fever. Patient denies using NSAIDs, alcohol, or drugs. On physical exam, she is in mild distress from pain and also does have mid-epigastric and right upper quadrant tenderness. Liver function tests are done and show elevated transaminase levels with mild elevation in alkaline phosphatase and total bilirubin. Lipase is elevated at 1500U/L. Which of the following is the best diagnostic test to perform at this time? Based on her symptoms and history, it is likely that the patient has acute pancreatitis. This is characterized by an inflammation of the pancreas that appears suddenly and lasts for days. The two main causes of pancreatitis in the US are alcohol intake and gallstones. This patient has no history of alcoholism to suggest alcoholic pancreatitis. The next test to obtain at this time is Choice A (Ultrasonography of the abdomen) to look for gallstones and to see if there is dilatation of the common bile duct. ● Choice B (CT of abdomen and pelvis with contrast) should be done 48-72 hours after the ultrasound if the patient’s pancreatitis is not improving. This would be done to look for complications like necrosis, pseudocyst, or abscess formation. ● Choice C (ERCP) is an invasive procedure and should not be done if there is no suggestion of common bile duct dilatation on an ultrasound of the abdomen. However, if there is dilatation however, an ERCP may be performed. We want to do a non-invasive procedure before doing an invasive procedure which is why an ultrasound should be done first. Doing an ERCP first is also not recommended because the ERCP can sometimes exacerbate the pancreatitis. ● Choice D (MRCP) is not correct. Such an extensive diagnostic test is not required before performing an ultrasound of the abdomen which also yields high information about the right upper quadrant. ● Choice E (Endoscopic ultrasound) would be done if there was evidence of pancreatic mass seen in a biopsy. This is not necessary at this time. Which of the following is a true statement regarding multiple endocrine neoplasia (MEN) syndrome? ● MEN type I (3 Ps). The three “Ps” of MEN type 1 are: Parathyroid hyperplasia, Pituitary tumors and Pancreatic islet cell tumors. ● MEN type IIa (1 M, 2 Ps). Medullary thyroid cancer, Pheochromocytoma, Parathyroid. ● MEN type IIb (2Ms, 1 P). Medullary thyroid cancer, Marfanoid habitus/mucosal neuroma, Pheochromocytoma. ● Choice A (MEN type I, IIa, and IIb are all autosomal recessive diseases) is incorrect because all types of MEN are autosomal dominant diseases. ● Choice B (Patients with low sugar and high calcium levels should be suspected to have MEN type IIa) is incorrect. Pancreatic islet cell tumors usually release increased insulin or increased gastrin levels into the bloodstream. It should be suspected in a patient with low sugar (hypoglycemia) and high calcium (hypercalcemia). Pancreatic islet cell tumors are associated with MEN type I, not MEN type II. ● Choice C (Medullary carcinoma of the thyroid is seen in MEN type I) is incorrect. Medullary carcinoma of the thyroid is seen in MEN type IIa and IIb. ● Choice D (Elevated urine catecholamine levels and its metabolites can be seen in MEN type IIa and type IIb) is the correct answer. Both MEN type IIa and type IIb have adrenal pheochromocytoma associated with it. Pheochromocytoma release catecholamines; therefore, both MEN type IIa and IIb will have elevated urine catecholamine and its metabolites appreciated. ● Choice E (Parathyroid hyperplasia is very common in MEN type IIb) is incorrect. Parathyroid hyperplasia is very rarely seen in MEN type IIb. 64-year-old male with no previous medical condition of note presents with atrial fibrillation. Which of the following is the most appropriate regimen for stroke prevention in this patient? ● For a score of 0, aspirin 325mg is the recommended antithrombotic regimen. 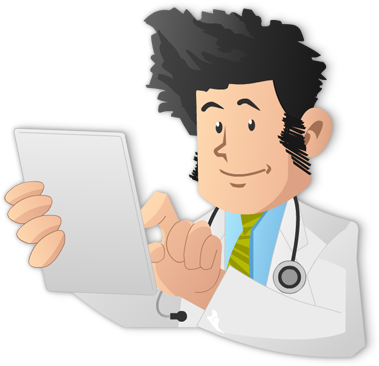 ● If patient has a score of 1, then either aspirin 325mg or oral anticoagulation can be used, based upon discussion between the physician and patient. ● A total score of 2 or more indicates that the patient’s annual stroke risk is high enough that it warrants oral anticoagulation (warfarin, dabigatran, rivaroxaban, or apixaban). ● Choice A (Aspirin 325mg once daily) is the correct answer. This patient’s CHADS2 score is 0 and his CHA2DS2-VASc score is 0. Thus, aspirin 325 mg is sufficient. ● Choice B (Aspirin 81mg once daily) is not correct. While aspirin can be used in patients with lower CHADS2 or CHA2DS2-VASc scores, the recommended dose is aspirin 325mg, since this was the dose studied in large atrial fibrillation trials. ● Choice C (Warfarin with target INR 2.0 - 3.0) is not correct. Since this patient’s risk level for stroke is low, the most appropriate therapy for this patient would be aspirin. ● Choice D (Warfarin with target INR 2.5 - 3.5) is not correct. While warfarin is used for atrial fibrillation patients with higher risk for stroke, the target INR is generally 2.0 - 3.0. A higher target INR of 2.5 to 3.5 should only be used in patients who develop thromboembolism while on warfarin with the lower target of 2.0 - 3.0.